Polyamines are short-chain aliphatic compounds containing multiple amine groups. They are important components of the cytosol of eukaryotes and are present at mmol L−1 concentrations inside phytoplankton cells, while complex polyamines play a role in biosilica deposition. Concentrations of polyamines measured in seawater are typically in the sub-nmol L−1 range, implying rapid and efficient uptake by osmotrophs, likely bacterioplankton. We measured turnover rates of three polyamines (putrescine, spermidine and spermine) using 3H-labeled compounds and determined their concentrations by HPLC to estimate polyamine contributions to dissolved organic matter and bacterioplankton carbon and nitrogen demand. These measurements were made on transects from the inner shelf to the Gulf Stream across the South Atlantic Bight (SAB) during April and October of 2011 and in salt marsh estuaries on the Georgia coast during August of 2011 and April of 2012. 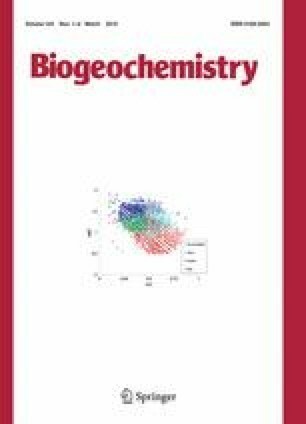 We found that turnover rates of polyamines were similar to those of amino acids (arginine and glutamic acid) measured in the same samples; however, fluxes of polyamines into bacterioplankton were much lower than amino acid fluxes as a result of low ambient concentrations. Turnover rates and fluxes of polyamines decreased from near-shore waters to the shelf-break, following the pattern of chlorophyll a concentration. Polyamine uptake accounted for less than 10 % of bacterial N demand and 5 % of bacterial C demand on average, with a large variation among water masses. Responsible Editor: Dr. Mark Brush. The online version of this article (doi: 10.1007/s10533-014-0056-1) contains supplementary material, which is available to authorized users. We thank the captain and crew of the R/V Savannah for their assistance with sample collection during two cruises, as well as Anna M. Bratcher for assisting with processing the nutrient data presented here. We would also like to thank the crew of the R/V Salty Dawg, especially Jacob Shalack, for assistance with sample collections at GCE-LTER sites, as well as Mary Price and Gracie Townsend for helping with facilities and equipment at UGAMI. This research was funded by the National Science Foundation (NSF OCE 1029742 to J.T.H and OCE 1029607 to X.M. ).